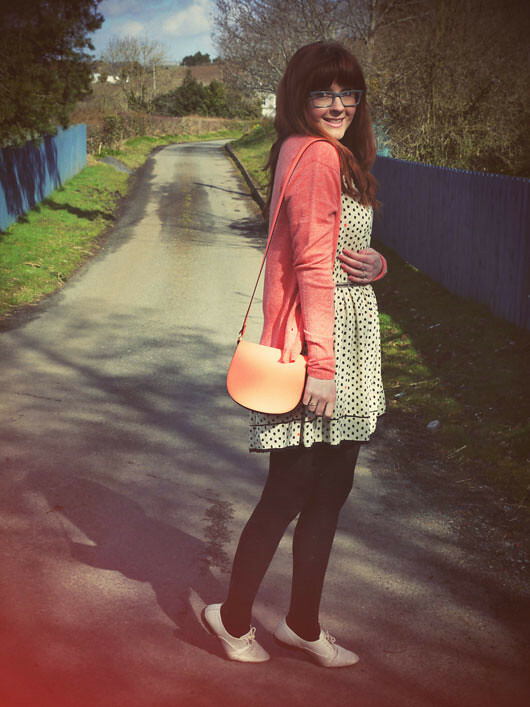 Dress: River Island, Belt: Jarlo, Cardigan: Mintmelon, Brogues: Topshop, Bag: H&M, Glasses: Gok Wan for Specsavers. I got 1 inch barrel curlers for my hair and I love the relaxed waves they give my hair... Ive never been one to do much with my hair, its so flippin thick I usually just blow dry it and twist it into a bun that way it has a bit of a wave to it. But these curlers are great at creating something a little more polished! Your hair looks lovely here and that dress is gorgeous! 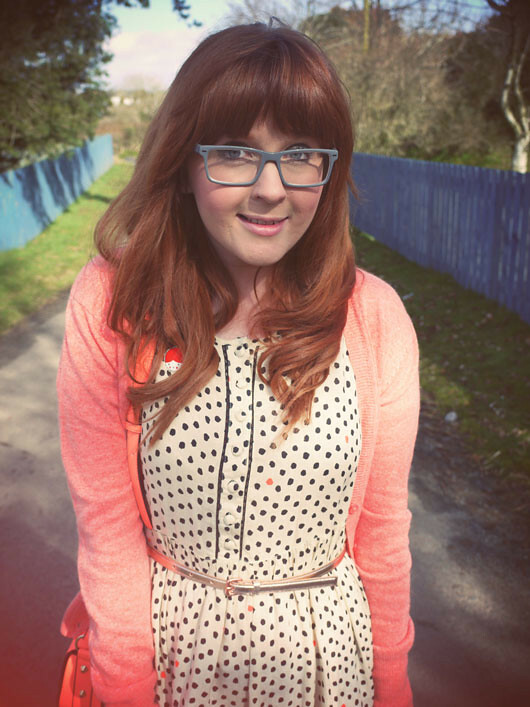 I know what you mean about blogging being a full time job, it is stressful! Your hair looks lovely! So smooth! And the dress is lovely, perfect for looking around the shops! Can't wait to see some weddings posts! Very pretty look for bridesmaid dress shopping! I like the dress so much! Your hair looks stunning! Polka dots always get a thumbs up from me! im so in love with your outfit!!! that dress looks dreamy, and the peach colour looks amazing on you. Must have been nice to have some company and to catch up on girl talk. Hey, seriously, I know you have your girl pals and all but if you ever decide to move on that Blog Assistant thing, I'm your best choice. I love what I do and my rates are more than reasonable. Part time is fine with me. Look me up @Abornewords. Your hair is gorgeous and that dress is so pretty! what a nice delicate looking dress! Love your hair here Vicki! <3 I need to try out these rollers myself, for sure. I'm so lazy with my hair most days, eek! Lovely Outfit.. You and your latest fashion clothes are always fabulous!! I love the waves in your hair too, looks put together but effortless. 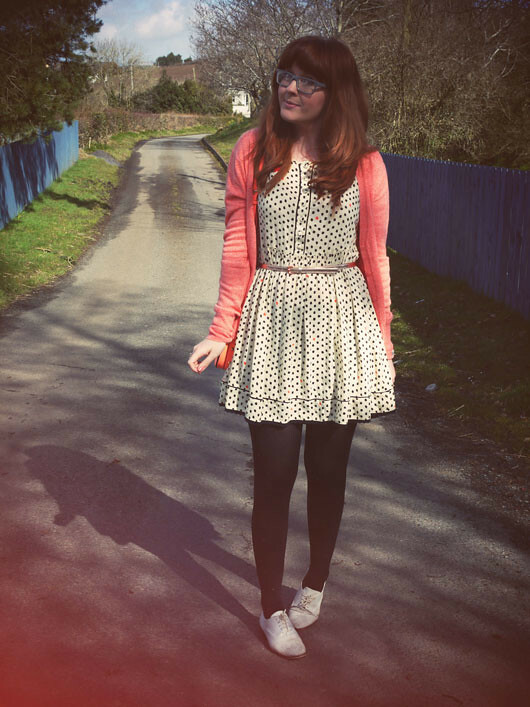 Such a cute feminine outfit for going hunting for bridesmaids dresses, love it! So so so pretty! 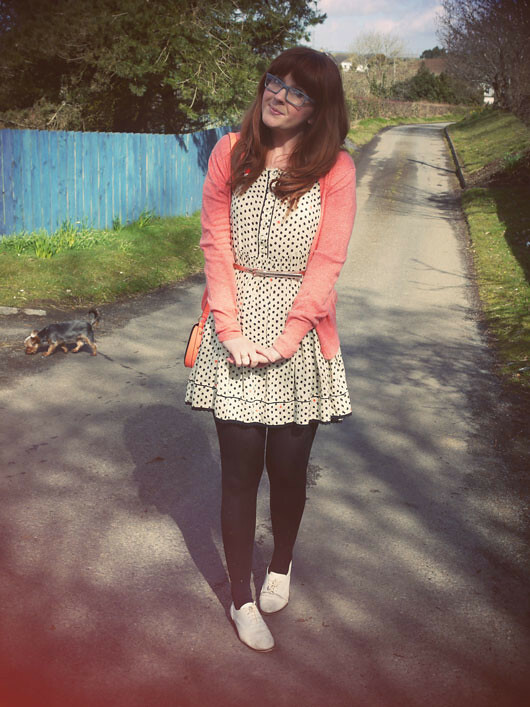 And I love that dress :) It looks great with that cardigan! lovely blog the bridesmaid dress was awesome.